← Ready Ka Na Ba Magbigay ng Regalo Ngayong Pasko? Malapit na Pasko. Panahon na ng mga reunion. Magkikita na naman kayo ng mga friends mo from High School or College. Ang mahirap neto, pag nakapag-kwentuhan na sila about TV series, Teleserye, o kahit na mga commercials. Kawawa ka naman, yung TV mo na de-antena, malabo pa sa sabaw ng pusit ang reception. I suggest you sign up for SKY on Demand. Pag nakita mo yung update ni High School crush tungkol sa The Walking Dead, dapat updated ka. Pag napag-kwentuhan ang AlDub, dapat alam mo yung commercial nila ng Bear Brand. Dapat din alam mo yung mga kinakanta ng 4th Impact sa X Factor UK. Gamitin mo pa yung Tablet mo. Go! SKY subscribers can now easily enjoy the best of local and foreign movies and TV series with “SKY on Demand’s” biggest lineup of live TV channels and on demand TV shows, as well as a wide selection of local and Hollywood blockbuster movies anytime, anywhere on any screen. 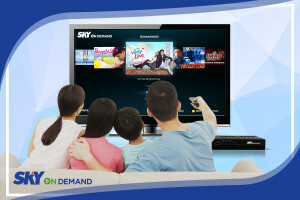 “SKY On Demand” is a multiscreen online video service launched by SKY Cable Corporation earlier this yearin time for its 25th anniversary, that allows SKY subscribers to stream cable TV shows and movies on their TVs, computers, smartphones, and tablets on their own time. Its roster of live TV channels is perfect for the entire family as it includes ABS-CBN HD, AXN, Asian Food Channel, Basketball TV, Disney Channel, History, Nickelodeon, Sony, HGTV, Warner TV and RTL-CBS Entertainment, among others. “SKY On Demand” also offers current and full seasons of the most popular shows on ABS-CBN in HD, including the top-rated shows like “On The Wings Of Love,” “Pangako Sa ‘Yo,” and “AngProbinsiyano,” which SKY subscribers can watch on demand anytime. Even binge watching blockbuster hits throughout the years is made possible by the “SKY on Demand” Premium Pack with its collection of classic and popular movies from Star Cinema, Paramount Pictures, NBC-Universal, Regal Films, and Viva Films such as “Star Trek, Transformers: Revenge of the Fallen,” “How To Train Your Dragon,” “One More Chance,” “Four Sisters and a Wedding,” and “24/7 In Love.” New users can enjoy a 60-day free trial to the Premium Pack. “SKY on Demand” is exclusive to all SKY subscribers and is accessible through a SKY broadband connection at home or through SKY Mobi to enjoy the service on the go. SKY Cable subscribers can upgrade to a SKY On Demand Digibox to watch all this content on their TV. The “SKY On Demand” mobile application is also downloadable from the Apple store and Google Play store. The availability of shows and channels is based on a SKY subscriber’s current cable TV plan. For more information, visit www.mysky.com.ph/skyondemand. This entry was posted in TV updates and tagged abscbn, cable, mobile, sky, skycable, tablet. Bookmark the permalink. Wag kang bibisita sa LIBING ko... Baka tumibok ulit ang PUSO ko.